Feudal Japan. The samurai are in their pomp. Honour, valour and courage mean something. 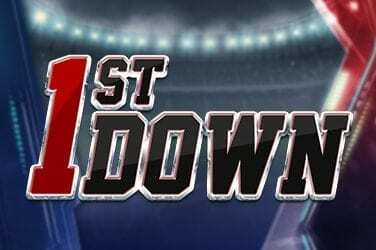 As do superb visuals, amusing animations and an incredible 480 free games. 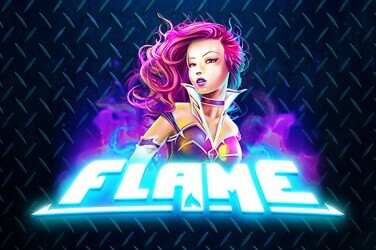 These last three will be of particular interest to online slots fans, and all three are present and correct here across the game’s five reels and 25 paylines. NextGen also treats us to two in-game bonus features that can be triggered on any spin. Swords, nunchucks and tenterhooks at the ready! 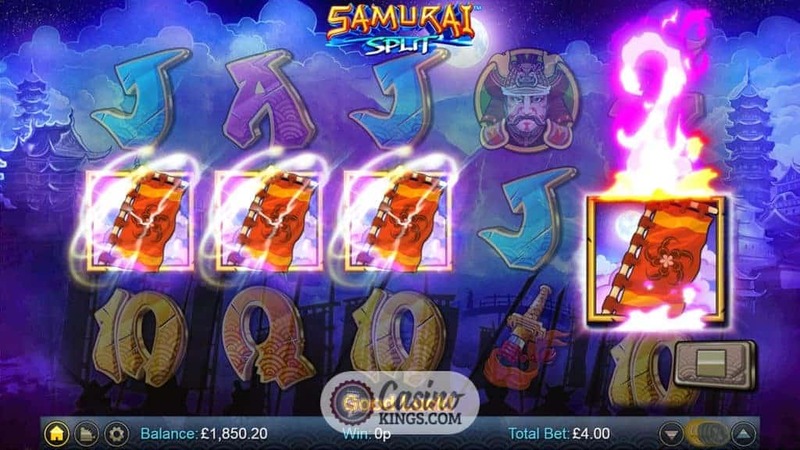 NextGen has melded classic with original to deliver the artwork for Samurai Split. The backdrop is vintage Japan, with pagodas stretching across a misty mountainous backdrop. The artwork on the reels is much more cartoonish. The Mask, Temple, Horse, Sword and Bottle symbols that make up our higher-payers stand out in a caseless reel case design, spinning immersively in front of the atmospheric backdrop. 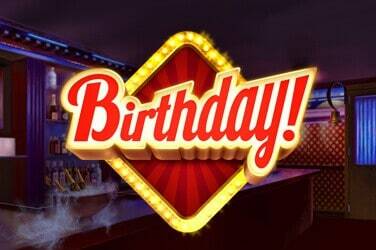 10s through Aces, drawn in a funky classical style, make up the numbers as our lower-paying symbols. And while the cartoonish artwork style proves a neat contrast to the classical art of the backdrop, it is the animation in the Split Symbol bonus that injects real vigour into the gameplay. On any winning spin, a Samurai Warrior can leap onto the reels and wield his sword to split symbols, even Wilds. Suddenly, a five-of-a-kind win can split to two, three or four five-of-a-kind wins. It is a neat feature that elevates our base game play to the next level and can multiply wins by up to x32. 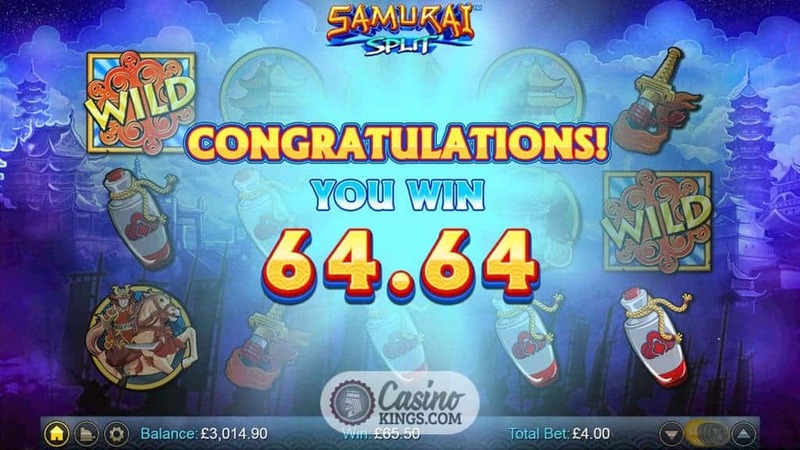 Not only can our random Samurai award the Split Symbol feature on any winning spin, but he can also split Scatters when we land three or more to trigger the Free Spins bonus feature. 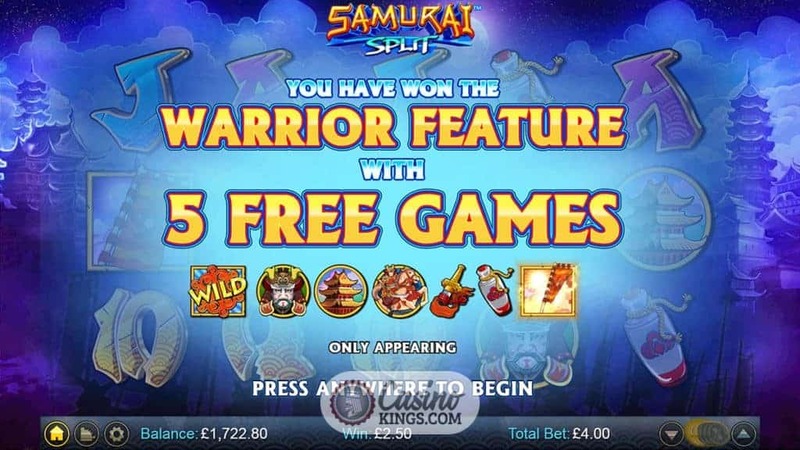 Three, four or five Scatters yield 5, 10 or 15 free games, but our Samurai can leap on and split any and all Scatters, leaving us with the potential for up to an incredible 480 free games! 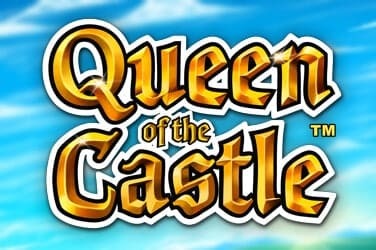 Throughout the free spins, only the Wild, Mask, Temple, Horse, Sword and Bottle symbols appear, giving us plenty of potential for wins of the whopping kind. To top off these two bonus features, we can also look forward to the randomly-triggered Warrior Spin. 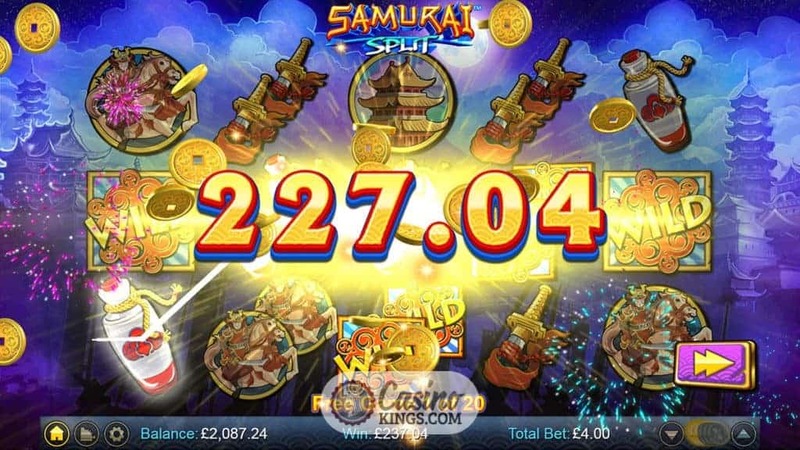 On any spin, our Samurai Warrior can launch the Warrior Spin, leaving only the high-paying symbols on the reels to land us bigger wins. Two bonus features clearly weren’t enough for NextGen and, let’s face it, we online slots players can never have enough. 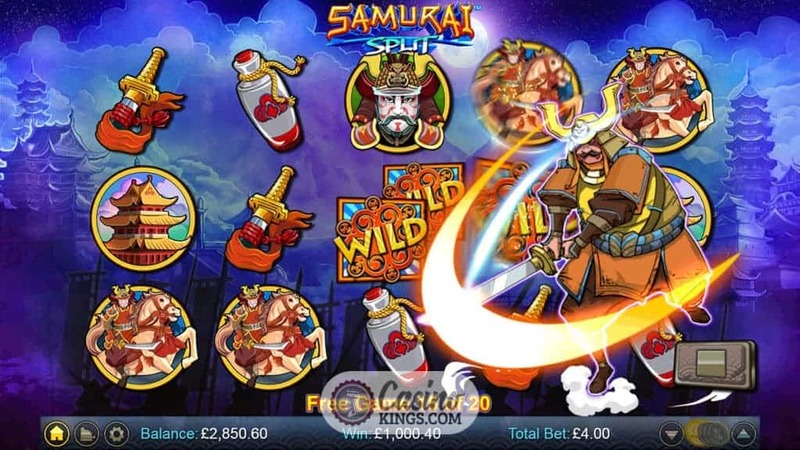 The contrast between the classic and the cartoonish works well, while the dangling carrot of 480 free spins would not be sneezed at by even the most honoured of Samurai Warriors. All in all this is a winning effort from NextGen, and wins, after all, are what we all seek.